Today was the First Main WSFS Business Meeting. Whereas yesterday was about arguing over debate time limits and trying to kill unpopular proposals, today's meeting was substantive business. This is the view I had of most of the meeting from my desk next to Lisa's camera platform. Except when I was participating in the debate myself, which did happen a few times. I took this picture about ten minutes before the start of the meeting as people were filing in. Today we were able to get a second lectern, and this did indeed speed things up quite a bit, as people could go to the nearest one. It also helped when there were some question-and-answer sessions, as the person nominally holding the floor could yield to a different speaker without having to step away from the lectern. I thought today's meeting went much more smoothly than yesterday, although that is in part the nature of the Preliminary versus the Main Business Meeting. I'm grateful to jared_dashoff's summary of business in the Newsletter; otherwise I would have lost track myself. 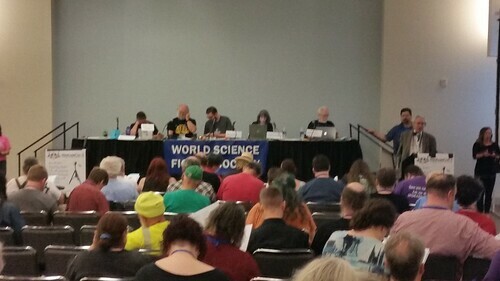 December is Good Enough: Moves the deadline by which time you must be a member of Worldcon in order to nominate for the Hugo Awards from the end of January to the end of the previous December. Defining North America: Adds a technical definition of North America to the Constitution, primarily to make it clearer as to which places would not trigger a NASFiC should a Worldcon be held there. I was involved in the last of these, on behalf of the Nitpicking & Flyspecking Committee. We'll pick up the remaining agenda items after Site Selection. The three Hugo-related items (ratification of E Pluribus Hugo, 4 and 6, and first passage of EPH Plus) have already been postponed to Sunday. Anything we don't finish on Saturday lays over until Sunday. 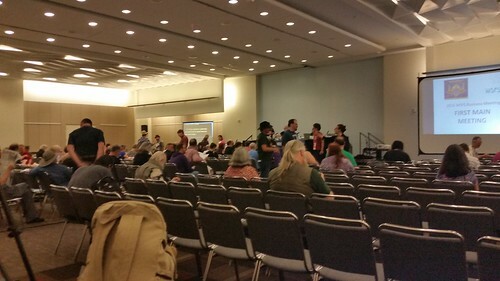 Sunday goes until we finish all of the business or the Convention Center kicks us out. The first of Friday's WSFS Business Meeting videos was online about halfway through the meeting. The last posted perhaps 30 minutes or so after adjournment. Later that afternoon I got e-mail from Jared Dashoff asking me to get the room locked up. I wrote back that I'd do so once I got back from lunch, which was off-site, and is another story.